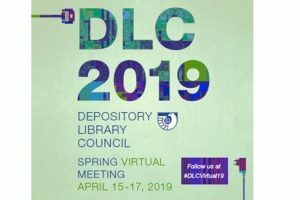 The U.S. Government Publishing Office (GPO) and the Depository Library Council are hosting the 2019 Spring Depository Library Council Virtual Meeting. Occurring April 15-17, 2019, daily from 1:00 – 4:30 p.m. (EDT), the 3 day free conference will discuss the Federal Register Modernization Act, collaboration projects, and updates from GPO. The virtual meeting is an excellent opportunity to interact with other federal document librarians, and discuss current trends and issues in the community. Check FDLP’s slides and handouts for next week’s conference, and follow the event on twitter at #DLCVirtual19. Remember to register for the free event.